Clay participates in Bowling, Swimming, Basketball and Golf. He was nominated as Athlete of the Month by the Bowling Coach because he always has a good attitude and is flexible when the coach has to move him around. Clay works at Harlan Bakeries and enjoys watching John Candy movies and driving his car. He is always so courteous and polite to his coaches and fellow athletes and is a great example of what our Spirit team is about! Stephanie has participated in Basketball and Bowling. 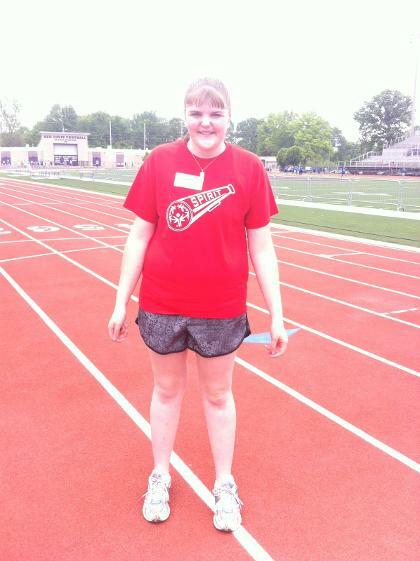 She was nominated as our athlete of the month because of her sweet spirit and smiling face. These are two of the greatest attributes of a Hendricks County Spirit Athlete. Something noticeable to everyone is the special bond that Stephanie has with her sister Abby. The Spirit team is blessed to have both of them as part of our group. Stephanie has been on a recent health journey that many fellow Spirit team members and family have been following and have been praying for her. Everyone was so happy to see her back at bowling practice and look forward to seeing her at many more S.O. events in the future! Laurie participates in Cheerleading, Bowling and Track & Field. She was nominated as our Athlete of the Month because of her awesome bowling skills. She tries really hard, is consistent, scores really well, has a great attitude and everyone loves her smile! Laurie also works at Sycamore Services and enjoys playing games on her tablet. She is so sweet and we love having her part of our Spirit team!! Matthew participates in Basketball, Bowling, Track & Field, Golf and Ballroom Dance. Matthew is a true competitor and recently won 4 gold medals and 1 silver at the State Ballroom Dance competition! Matthew was nominated as our athlete of the month because of his easy going positive attitude and because he is an all around great athlete. He is reliable, never misses a practice, is kind to others and never complains. Originally Matthew just wanted to be an observer at ballroom dance but they were short on participants so he tried it and has stuck with it ever since. He is always ready and willing to practice his dance steps. Matthew enjoys going trout fishing with his dad, grandpa and twin brother Michael (who he is 20 minutes older than!). Matthew likes to draw, collect air soft guns, go to church and works at Pizza Hut. We're proud of Matthew's accomplishments and to have him as part of our Spirit team. He is a strong athlete which he recently demonstrated at a birthday party when no one could break the piñata and Matthew broke it open with one big blow! Mark participates in Basketball, Bowling, Equestrian, Golf and Track & Field. 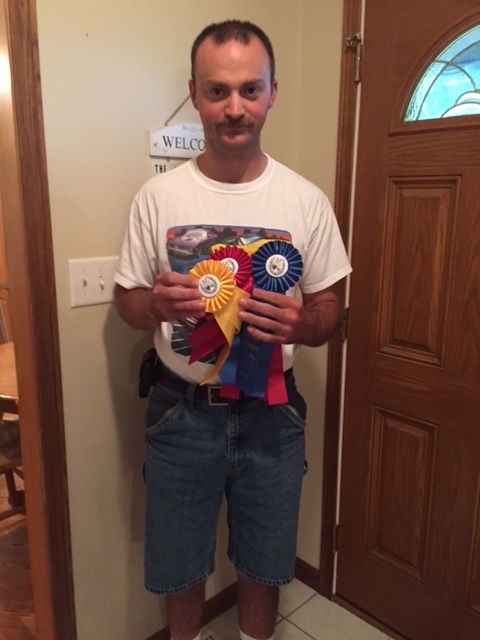 He has earned many medals and ribbons over the past 10 years of competing in Special Olympic events such as the ribbons (pictured left) that he earned from Horse shows. 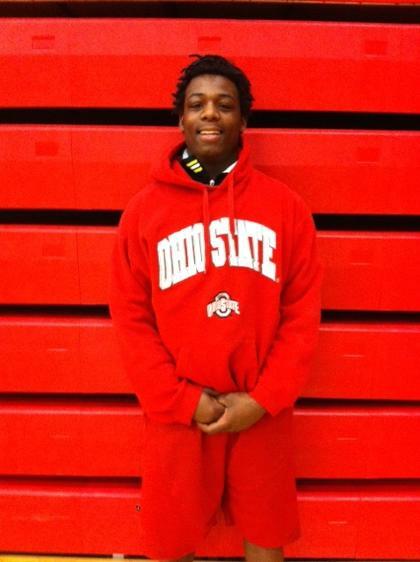 Mark was nominated as the athlete of the month because of his dedication to each sport that he participates in. He is always at every practice and works hard to constantly improve. He even took extra individual Track practices with one of the volunteer coaches in preparation for competing in the state games. Mark takes his sports seriously - you can see his level of concentration when he's on his horse but he also has a lot of fun and really enjoys it. He likes being with his friends and teammates and is always respectful of adults. This was apparent at the Taylor basketball tournament when the referees awarded Mark with a trophy for displaying good sportsmanship and respect throughout the game. Mark enjoys going on group outings with friends such as rock climbing and driving go-karts. He also enjoys helping his Mom around the house, doing yard work and sometimes playing Wii and he works at Kroger in Avon - he's a busy guy! We are very proud to have Mark a part of the Hendricks Co. Spirit team, he sets a great example for all of the athletes with his hard work ethic, determined mind and sweet disposition. 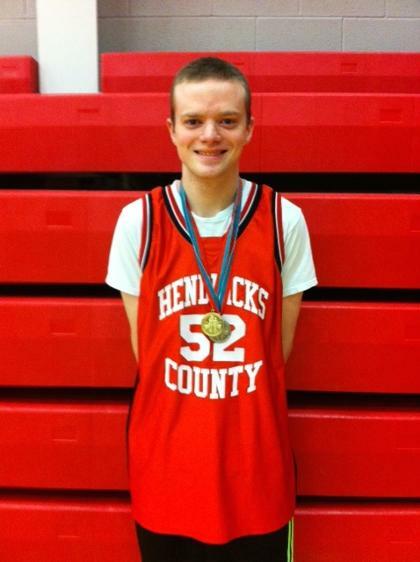 Ken has been participating in Special Olympics for several years in both Marion and Hendricks county. He has competed in Basketball, Softball, Track & Field, Bocce and Bowling. Ken was nominated as the Athlete of the Month because of his great attitude. An example of this was at a basketball game where there was going to be too many players so Kenny couldn't dress for the game and several people noticed how well he handled it. He didn't complain, he kept his great smile and his "Spirit" attitude. As it ended up another player didn't show up so Kenny got to dress for the game after all but it was so nice to see an athlete setting such a good example of sportsmanship. Ken is retired from Sycamore Services. He likes to watch movies - especially comedies and doesn't care so much for scary ones! Ken will be competing in Bocce at the state games in June and we are all really looking forward to spending the weekend with him. He has been a great addition to our Bocce team this year and has made it even more fun. This is Brooke's first year to compete in Special Olympics and she has made a great impression and impact in a short amount of time. So far Brooke has participated in Bowling, Basketball and Track & Field. Brooke was nominated as our Athlete of the Month for so many reasons. Just a few of the words that were used to describe her and why she is being nominated are tenacity, dedication, attitude, fearless, focused, determined, caring and has a great smile! We have all been so impressed by her willingness to push herself in track & field by running longer distances and trying the running long jump. You can see her focus when she's running as she stays perfectly in her lane and is not distracted by the other runners. Brooke is setting a great example for other athletes. We are really looking forward to seeing Brooke compete in the State Games in Terre Haute this summer and in future events. What a great addition she has been to our Spirit team!! Lorrie participates in Basketball, Bocce, Bowling, Dance and Track & Field. She has earned numerous medals over the years such as the bronze medal that she and her longtime friend and Bocce partner Connie won at the 2014 State Games in Terre Haute last summer. Most recently Lorrie was part of the Spirit 1 basketball team that won the championship at the Take it to the Hoops tournament at Taylor University. The team also won sectionals at Pike and advanced to State where they placed 3rd and received bronze medals. 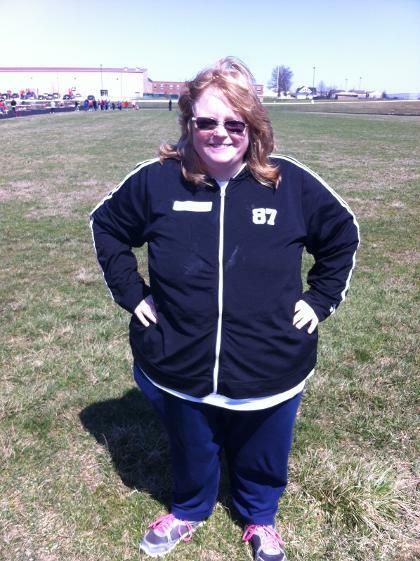 Lorrie is a Brownsburg High School graduate and likes to attend the Friday night football games with her friend Connie. She also enjoys shopping and spending time with her family. She is always on the go with her sister Jen and mom Cookie. Lorrie was nominated as the athlete of the month because of her dedication to the basketball team. Whether in the game or on the sideline, Lorrie shows her "Spirit" enthusiasm by encouraging and supporting her teammates. She is always positive and upbeat, never misses a practice, always tries hard and never gives up. Lorrie is helpful to her teammates and coaches in every sport that she participates in and is a true Spirit team player. This is Brian's first year to participate in Special Olympics. Brian joined our Spirit 1 basketball team and has made quite an impact to the program. Brian has some tremendous basketball skills and is fun and impressive to watch on the court. He recently lead the team to not only our first victory at the Take it to the Hoops tournament at Taylor University, but to winning the overall grand championship in our division!!! What a great experience for everyone there to be a part of. We are hoping that he will continue to be a part of our Spirit group and try out some new sports with us. His natural athletic ability will help him to be successful in any sport he wants to try. In addition to his involvement in Special Olympics, Brian works at Goodwill and likes to play video games. Brian was nominated as the athlete of the month because of his leadership and sportsmanship on the basketball court. This was evident in one of the games at Taylor when Brian had an open chance for an easy layup but he chose to pass to a teammate instead. That teammate went on to score the basket and enjoyed the limelight for that moment. Although Brian scores the majority of the points in each game, he always looks for the open man and plays as a team and not an individual. What a great example of a true Spirit athlete!! Jeff participates in Basketball, Bowling, Track and Field, Equestrian and Golf. Jeff has earned many awards from competing in Special Olympics such as the medals that he's wearing pictured left which are from Track and Field from running and the softball throw (he's also really good at the standing long jump!). 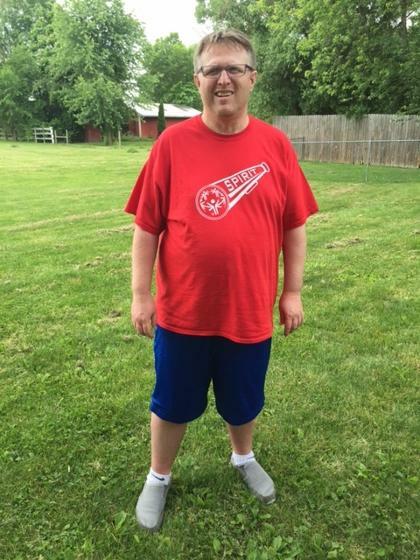 In addition to his involvement in Special Olympics, Jeff loves playing games with his niece and nephews - especially playing ball. He works at Sycamore Services and attends Bible study on Thursday nights along with his friends. Some people know Jeff as Mr. Smiley because of his constant grin - if you know Jeff then you know that contagious smile. Sometimes at basketball he's also known as "Big Foot" and can sure bring down those rebounds! Jeff was nominated as the athlete of the month because of the great attitude he had (and always has) at the Strikes bowling event. After ending up without a teammate to bowl with, he happily continued on by himself without a complaint. Eventually he was able to bowl with another group and made some new friends who were happy to have him on their team. Jeff is truly such a sweet person and makes Special Olympics that much more special! !